Track 2, Car 5, Seats 39 and 40. Bangkok to Chiang Mai. 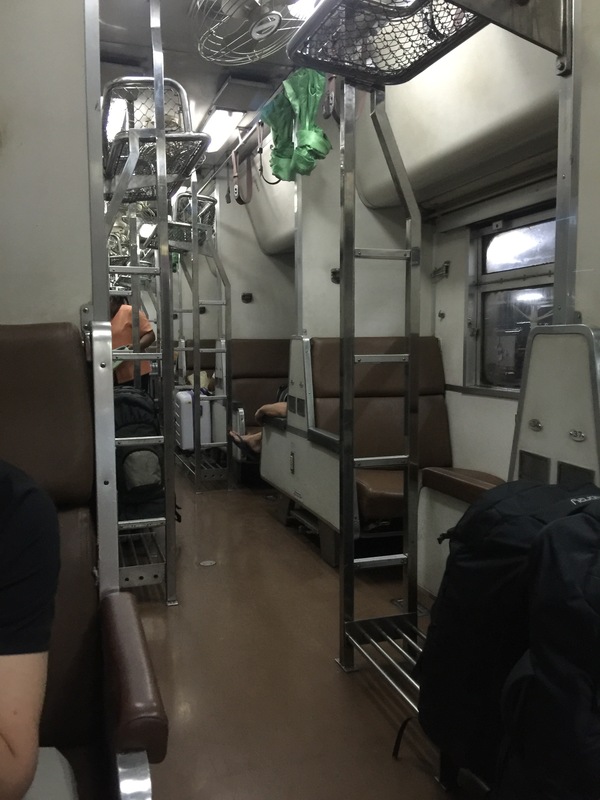 Just that morning we had booked an overnight train from Bangkok to Chiang Mai. 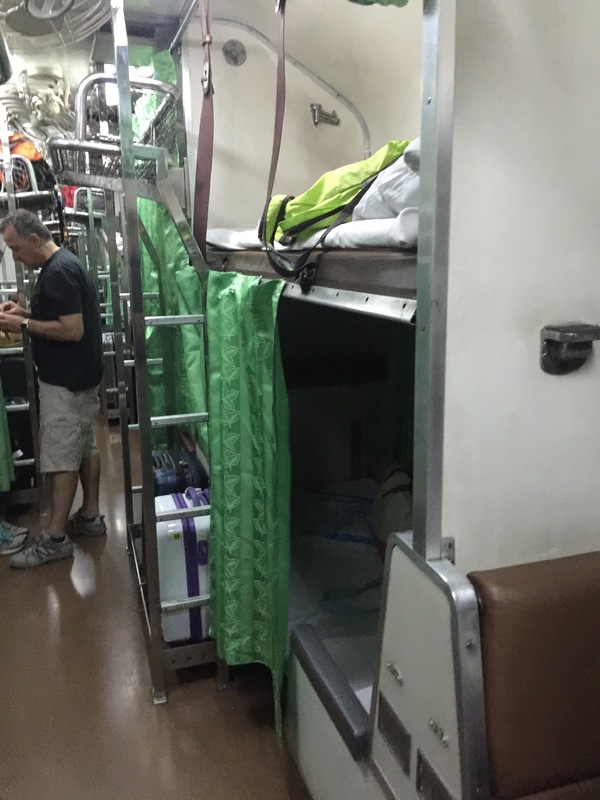 We were on a second class sleeper with air condition, and had one upper and one lower bunk. When we boarded the train, the seats he not been configured into the beds. We left the station about twenty minutes behind schedule. As our journey began, and we heard the clanking of metal as the train travelled down the tracks we both wondered how in the world we would be able to sleep through this. At around eight o’clock, the train attendants came by and signaled that it was time to convert the seats into their sleeping position. In a matter of seconds, the seats were pulled together and later flat. Next, the upper bunk was released from its stored position. A thin mattress was placed on each bed, with a pillow and fresh linens. Curtains were hung for privacy and we were all set for bed! Jess and I both sat on the lower bunk, facing each other with a flashlight for light as the overhead reading light we were supposed to have was nowhere to be found. We sat and devoured our take away Pad Thai from Thip Samai Noodles that we debated ordering after a delicious meal just a few hours before. We were glad we brought food, as the food served on the train was overpriced and didn’t look to good. When the attendant came around to take breakfast orders we opted to skip that as well as we were arriving in Chiang Mai early. Security on the train seemed to be pretty good. Next to each bed is a luggage rack that most everybody used to store their bags, which you should always ensure is locked. We recommend sleeping with a small bag of your valuables by your head as an extra precaution. At one point in the night, I heard the train attendant tell somebody who “was walking around because he couldn’t sleep”, that he was not allowed to and had to return to his bed. This was slightly comforting as I knew that the attendant was keeping watch over everybody and their belongings. Ultimately, the key to ensuring the safety of your belongings is to always keep them in sight. Since this is nearly impossible when sleeping, the trick is to make your belongings a bit more difficult to steal or get into compared to everybody else around you. (Stay tuned for an article regarding safety tips while traveling). As our seats were at the end of the train car, we had the unfortunate pleasure of having a louder than normal train ride. When sitting in the center of the train car, the clanking noise of the train is at a minimum. It seems as if these seats sell out first, especially the lower bunks. Lower bunks are more spacious, in both their width and height, and have the luxury of a window. The upper bunk is narrow, with minimal head room, and no window. In addition the fluorescent lights, where stayed on all night, shine in from above the curtain. If your stuck with an upper bunk a sleep mask could definitely come in handy, and if your at the end of the train car a set of ear plugs should help a bit. Even with the noise and a bit of tossing and turning we awoke feeling surprisingly rested. We were still about an hour outside of Chiang Mai. We brushed our teeth and freshened up and the train attendant came to put the beds away. We sat and watched the mountains in the distance, and arrived in Chiang Mai in no time. We couldn’t wait to explore this new city and see what it had to offer us in terms of activities and new northern Thailand cuisine!